This is the kind of picture that can inspire a 'wow' for a moment. The kind that makes you take note of the photographer. The kind that makes you want to see something fresh and exhilirating yourself, and capture it. This picture is by Chase Jarvis. 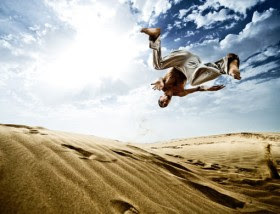 I love that the action puts still more emphasis on the beauty and majestic grace of the dunes and desert sky. Soon after, I am sure, nature would have blown away the footprints of the dancer, and the sands shifted once more, unimpressed, unaffected. very inspiring photo ...i love it very much....the creativity you have did in it that was awesome..